It's been said many times and it bears repeating often: there has never been a better time to be a Star Wars fan. Not only are there new movies coming out every year, but there is an animated series airing weekly, as well as countless novels and comic books every year (video games are in a bit of a rut, but we're still early into this new era). And now talks are ongoing about what the next animated series might be, according to Ben Sherwood, the president of the Disney/ABC Television Group. Sherwood spoke with The Hollywood Reporter this week regarding several issues affecting Disney television, and he addressed the topic of Star Wars on TV. There have been rumblings about a new animated series for some time now, and they heated up a few weeks ago when animation writer Jennifer Muro revealed she was working on a new project for Lucasfilm. The question many fans may have is, how will this new series affect Star Wars Rebels, which is currently heading into its third season. 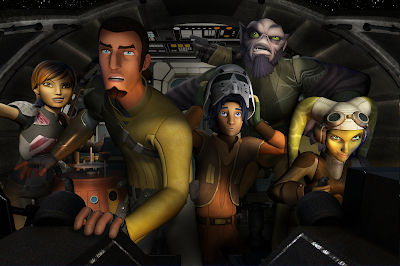 While initial rumors about a new animated series suggested that Rebels would be going off the air, that doesn't necessarily need to happen. Sooner or later we'll see a situation with more than one Star Wars series on the air, and Disney may be happy enough with Rebels to see if it can work now. "Not only are there new movies coming out every week, but.." You mean 'every year' right? As far I know, rebels is planned for just three seasons, Filoni said that... unless they have changed the plan, I haven't hear anything, did you? Freddie Prinze Jr. already confirmed they are recording s4. Just because they are having discussion doesn't mean it's already in pre development. The new show will air once rebels wraps up. And my opinion rebels will end after its fifth season. Filoni did confirm that the soul purpose of Rebels was to lead it into Rogue One. He also said that season 3 might be the last season but if it is not then season 4 will 100% be the last season for the series. Well I'm currently working on "BB-8 Adventures" for a targeted younger audience, but I would be disappointed if we didn't move forward with a live action show. Side note: I'm leaning towards the old Republic. Why can't 2 shows be going. When one is in production, the other would be airing. I'd like to see a 5 season show on obi wan and qui gonn (pre menace). I'd take 5 seasons of Anakin and obi set between phantom and attack (not that either is necessary). Old republic with revan, or a series on darth bane. Something on the crime world in star wars, but we'll probably get something set between jedi and tfa. I'm fine with that too.